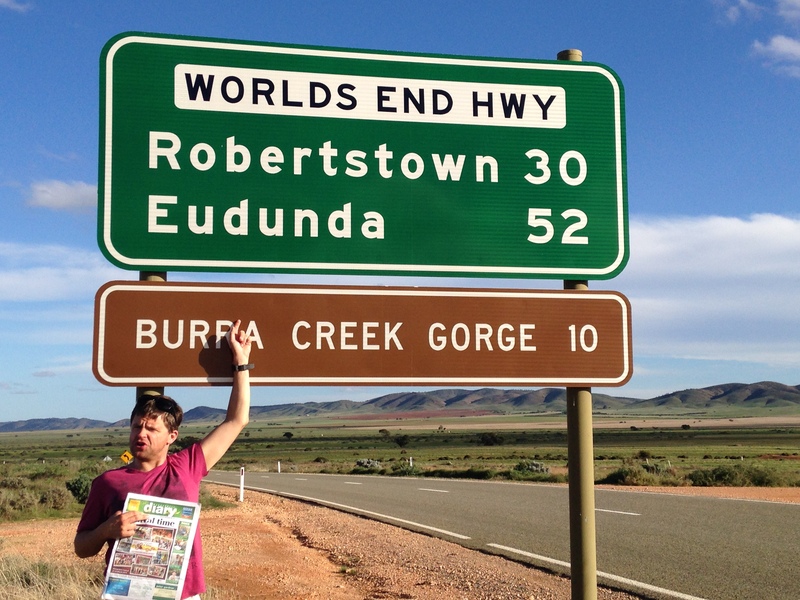 We reluctantly left Burra for Morgan, where our little cottage on wheels awaited us, on the way out I noticed the sign saying Worlds End Highway, this was a chance to go to the end of the world, it was also the road to Burra Gorge and I thought another photo opportunity. The gorge features massive aged, river gums and a lush habitat for the surrounding birds and wild life. We stayed for a short time and as we drove out I noticed a car with signs on each door saying ‘Anglicare South Australia autism-specific early learning and care centre fund-raiser’. 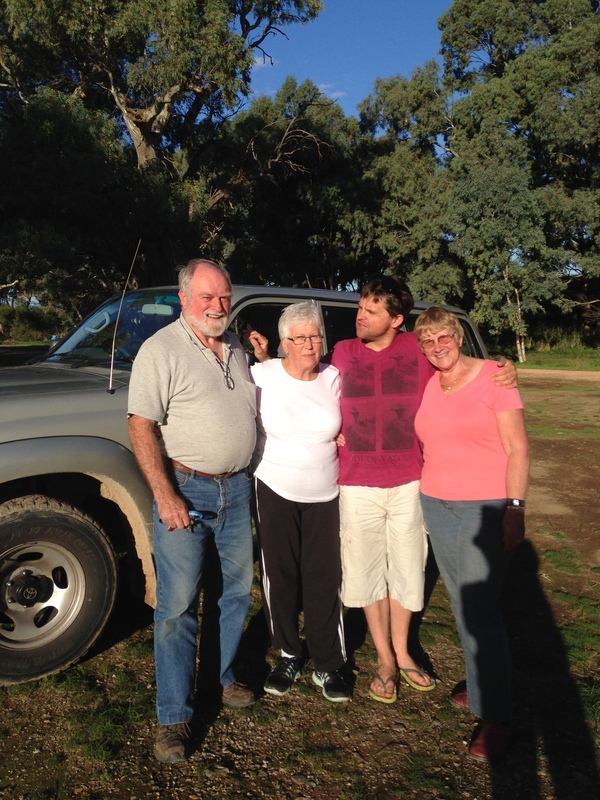 This was the support team for the guy we had heard about, Gary, who was about to celebrate his 72nd birthday, after cycling over 2000 kilometres and raising over $5000. Both parties were so excited to see each other and we exchanged details and our journeys with autism, unfortunately Gary was still out on the road and we thought we may not get the opportunity to meet him. As we left I saw a turn off to another part of the gorge and took a quick detour, to our surprise there was an artist working on a piece and we stopped and chatted and exchanged stories again. I photographed some more beautiful, old, twisted river gums but by this time Scott was really ready to go home. 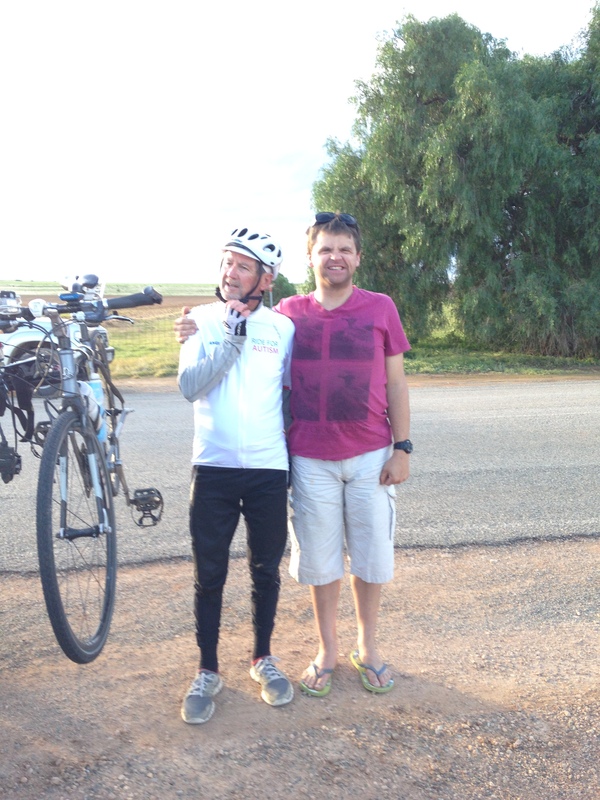 As we came out of the detour, how lucky were we, there was Gary, he had just pulled up to the support team and once again lots of photos. Scott really warmed to Gary as if he understood his quest, shaking hands and wrapping his arm across his shoulder, regardless of the fact Gary was tired and still trying to remove his helmet. Please support Autism, so many people have their heart in the right place and do extraordinary things. I have been humbled by the want and the love people have, to help others in this world. People say to me “I would love to be able to draw or paint, but I’m useless and couldn’t put pen to paper”. I say, be pro active give it a go. Only a few years ago I lost my brother to cancer, he was a ‘real’ Aussie guy; he loved the country life and was very successful, even if he didn’t take all the accolades he should have. A kind man with a childhood and short life full of diversity, he grew up in an era when being precious about all details in life was a long way from where we are today. He worked hard for his family and he believed he still had plenty of time to follow his dreams. 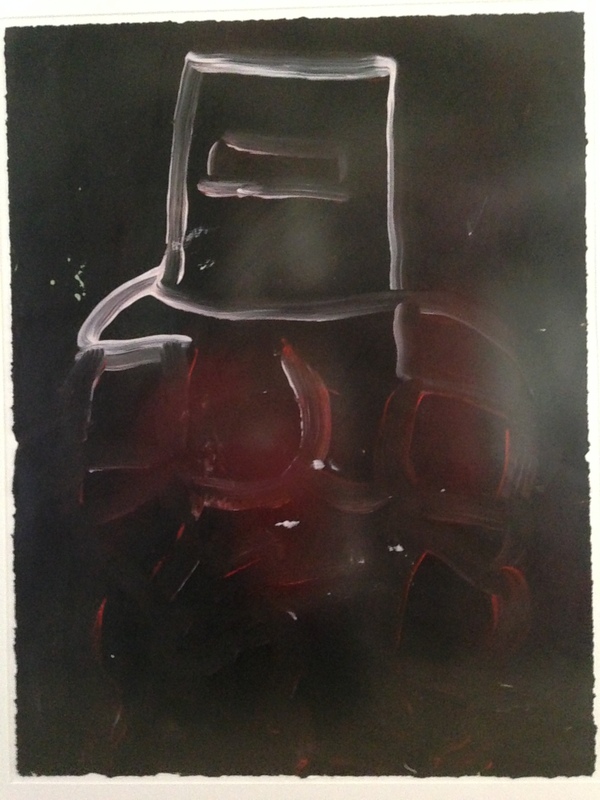 He visited us and often commented on a Ned Kelly painting Scott had done and he believed he could do something like that, he had a desire to find the artist in himself and at the moment of truth and facing the last things he could complete in life he took to painting. I believe just like all of us the artist was in him he had just never taken the chance. I’m not an artist, not in the sense of defined, detailed, magnificent oils and drawings like the ones we have seen hanging in galleries along the way, and I have no formal training or even knowledge, but I jumped the fence of doubt and gave it a go. Many years ago I wanted to be an artist but I was very shy and inhibited about what I did, so I stopped. Then I watched Scott, his no inhibitions or stop signs, just do what you feel, what you want, what you enjoy and be satisfied approach. Once I stopped worrying about how bad I was, and started to call myself an artist the satisfaction came. It doesn’t matter what other people think or have an opinion on, it’s just a judgement and an observation on what they think is right or wrong, good or bad I found most people either like or dislike art according to their own interpretation, and if one is looking for an expert, certified opinion then they are rare to find. If you want to do something, as Nike’ says “Just do it!” you’re the only one who has to look at it, it’s your choice if you want to show it around and get an opinion. Scott’s art however is so different and it’s not about the straightness of lines or the medium that’s used it’s about the spontaneity, the colour, the movement and the need and want to keep looking at it. I love Scott’s work because every time you revisit it, you feel and see something else. In my ignorance and lack of vision many years ago I felt a need to correct it. Now I endorse all his actions and work and encourage him to express all his feelings. I also realise I’m now on a quest to take him back to his innocence in art and not preparing him for other people’s criticisms. I have discovered Scott is a wonderful companion and friend; he is a patient affectionate man who thinks and acts just like other men and given time him maybe a philosopher. Conversation is limited but words don’t describe everything.